You know Bert Sisler as one of our active chapter members. You may not know that Bert was our first chapter president. Jon Cumpton interviewed Bert this month to learn more about his extensive experience in aviation. How did you first get interested in flying? That would have been as a kid in the early 1930â€™s in Grand Rapids. They didnâ€™t have an airport then, but every year or so these barnstormers would fly in and as they flew over we would run out and catch the adver- tising bills they dropped. A group of us started building airplane models in grade school. We had no guidance, so they were pretty crude, and we never had much luck flying them â€“ it was more like we would go out and practice breaking them! My dad said I had an obsession with airplanes, and I suppose he was right. But we were pretty much on our own, and there was really no competition and not much to focus our interest on. Later they built an airport (grass field in those days) in Grand Rapids, and that was a great help. Do you remember your first airplane ride? This month, we decided it would be a good time to profile our new chapter vice-president. The picture at left was taken at American Wings Museum before our December meeting. My father was a Naval Aviator in the late 60′s. There was always a flight suit and helmet in the closet while I was growing up. 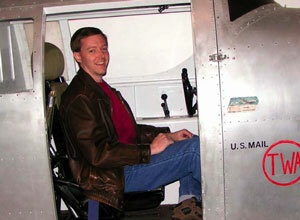 After the military, Dad worked as a CFI to supplement his income, and I got a few flights as ride-alongs. This is probably where my interest in GA was born. Mr. Martin, following 22 years as an Air Force pilot, and 5 years as a captain for Japan Airlines, joined a small cadre of foreign pilots flying for an air charter company in Tehran, Iran. His military service included 10 years in overseas assignments, including flying combat cargo support missions during the Vietnam War. He retired from the Air Force in 1970 with the rank of Lieutenant Colonel. From 1970 to 1975, he flew as a captain for Japan Domestic Airlines where he commanded a Japanese aircraft, crewed by Japanese copilots and Japanese flight attendants. Many of Colonel Martin’s flights in Japan were unique, in that he flew with several senior Japanese pilots who had participated in the bombing of Pearl Harbor on December 7, 1941. When in Japan he met, and later married, a senior Japanese flight attendant. After his contract in Japan ended he relocated to Tehran, Iran where, from 1976 to 1979, he worked for an air charter company, flying throughout the Middle East transporting members of the late Shah’s family, high ranking Iranian military and government officials, and oil field roughnecks. He was in Iran during the troubling years of 1978 when Islamic fundamentalists rioted in the streets seeking the overthrow of the Shah. The tempo of the demonstrations rose to the point where thousands were killed, forcing the Shah to flee to Egypt. When a personal friend was killed, Colonel Martin feared for his own safety and made a hurried exodus, abandoning unpaid salary, a Volkswagen, and personal property. The Shah’s abdication allowed the fire-brand Islamic leader, Ayatollah Khomeini, to assume the position as Iran’s despotic ruler, and form a ruthless Islamic theocracy government. Several of Mr. Martin’s Iranian pilot colleagues, and VIP passengers, were summarily executed by Islamic revolutionary guards after Khomeini’s takeover. Lou Martin’s book, “Wings Over Persia,” is a true story of intrigue and adventure of an American pilot flying in Iran, during the revolution that overthrew the Shah. It provides a unique opportunity to share in the experience of flying in a troubling part of the world, along with a first hand insight into the inflexible attitude of Islamic Fundamentalists towards infidels. Readers state that, “Wings Over Persia” has given them a much better understanding of the problems we face in the Middle East, while at the same time providing an interesting book that is difficult to put down. Congratulations Lou! “Wings Over Persia” may be reviewed on “Google” search web page, and Amazon.com. Lou Martin may be contacted at: [email protected], or Tel: 952-891-1250. We learned with great sadness on September 11th of the passing of one of our long-time members, Earl Adams. Earl was born September 24, 1930 in Hayward, Wisconsin. 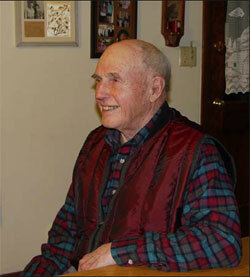 He moved to St. Paul for his freshman year at Central high school and joined the Air Guard in 1947. He had his first airplane ride in an AT-6 at Holman Field in October of 1947. He graduated high school in June of 1949 and then worked for General Air at the St. Paul airport until September. He then attended Air Force Mechanic School at Shepherd Field, Texas and graduated in May of 1950. He flew his first solo in a PT-19 in Wichita Falls, Texas on October 30, 1949, and received his Private PilotÂ¹s license in 1950. Earl was activated in 1950 and shipped to the Far East. He was stationed in Japan as a flight engineer on a DC-3, and flew a few combat missions in a B-26 dropping propaganda material in North Korea. Earl returned home in August of 1952. He flew as a flight attendant for North Central until spring of 1954 when he became the fixed base operator at the Worthington Airport. He repaired aircraft, gave flight instruction, and sprayed crops until re-joining North Central Airlines as a pilot in 1956. He also did some barnstorming out of Worthington with Eldon Sorenson. Earl had a long and distinguished career with Northwest Airlines. A number of chapter members served at Northwest with Earl, and recount their memories of flying with him. He began flying as first officer in DC 3Â¹s, and moved to the left seat in 1958. He later moved to Convair 340Â¹s, 440Â¹s, then 580Â¹s, and subsequently to DC 9Â¹s. He flew Republic Boeing 757Â¹s for a time until they were sold by Northwest, and then returned to DC 9Â¹s, this time DC 9-80Â¹s until his retirement in September of 1990. Earl flew over 100 different types of aircraft, including many warplanes (C-47, P-51, B-26) and virtually all Piper, Cessna, and Stinson models. Earl owned many airplanes, including a plans-built Casset and a Hatz open-cockpit biplane which he completely rebuilt. Among his other aircraft were a Pitts Special, and a J-3 Cub which he restored and first flew in 2001. Earl was a valued member of Chapter 25. He received the chapterÂ¹s highest service award, the Traveling Trophy, in 1991. 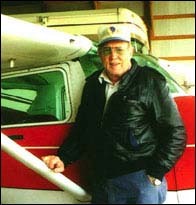 Members will remember Earl flying his Mooney 201 on chapter fly-outs and for Young Eagle events. 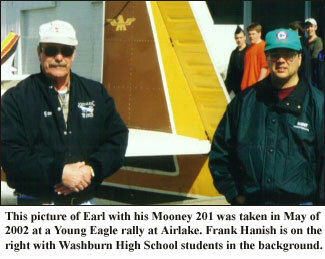 Earl flew his last Young Eagle mission for the chapter in May of 2002 (photo above right), when his battle with Lewy bodies disease began to curtail his flying activities. Earl continued to participate in chapter events as his health allowed. We extend our sympathies to EarlÂ¹s family. He will be missed. Obituary Posted: 9/24/04 Earl Frank Adams, 73, of Rosemount, died Sept. 11, 2004, at Ebenezer Ridges Care Center. He was born Sept. 24, 1930, in Hayward, Wis. He had been employed as a pilot for Northwest Airlines and was a member of the Rosemount American Legion. He was preceded in death by his son, Craig, and his parents, Earl and Laura Adams. He is survived by his wife, Donna Adams, son Clay (Cindy), daughter Christine Evaska, daughter-in-law Lisa Adams and six grandchildren, Suzanne, Katie, Sam, Skye, Max and Gabe. Services were held at Shepherd of the Valley Lutheran Church in Apple Valley and officiated by Rev. Duane Paetznick. Interment was at Fort Snelling National Cemetery.